Happy Halloween! Shane has been bubbling over with excitement for the past week for this trick-or-treating day to come. I am going to make him Tuna Spook Sandwiches for lunch. I posted this recipe last year, but since then I've made a few changes to it (I cut down on some of the oil and sugar). It's such a hit when ever I make them I thought I'd share it again. 1/2 package chocolate chips (OPTIONAL: I usually don't add the chocolate chips). In a large mixing bowl, beat eggs, sugar, pumpkin, and oil until smooth. Fill greased or paper-lined muffin cups 3/4 full. Bake 16-20 minutes for full size muffins and 10 minutes for mini muffins. Makes 24-30 muffins or 75+ mini muffins. I also got to use my Beater Blade that I won a couple weeks ago from Sweet Anna's Blog. It worked really well. I must say before the Beater Blade arrived I wasn't even sure where my Kitchen Aid mixer was. But the new fun tool made me locate it and now my beautiful mixer has a place up on the counter. I promise I won't lose her again! Sunday afternoon we ended up with a lost Black Lab in our backyard. A neighbor had found her and just wasn't sure what to do, so I offered to take her and figure something out. She didn't have a collar on making it SO hard to figure out how to get her back home. We took her to our Emergency Vet office where they were able to scan for a microchip. She had one, but it was registered to the Human Society where she had been adopted out of and they couldn't find any information on the people who had adopted her. The Vet offered to keep her in one of their runs for the night. Which was very nice since she was going to have to hang out in our garage because Dodger is dog aggressive. I called on Tuesday to check and see if they had found her family, but they hadn't and Animal Control had come and taken her. All week Kenny and I were so bothered by this sweet dog not going home to her family. You could tell she was loved, but we were so confused on why no one had claimed her or was looking for her. On Thursday morning Kenny saw a Lost Dog poster on our mailbox. It was her!!! They drove down to Animal Control in Kent (about 1 hour away) and picked her up safe and sound. You ask why am I telling you this random story?! Well...there a couple lessons to learn here if you are a pet owner. 1. Please, make sure your pets have collars and that they wear them at all times. We take our dogs collars off at night and have gotten really lazy about putting them back on during the day. You just never know when something weird will happen and a dog will get lost. Zilly's Dad said they had just given her a bath and put her out in the backyard to play. Their gate had accidentally been left open and off Zilly went. 2. You MUST update your pets microchip. The microchip is automatically registered to the place that put it in (Human Society, Rescue, Vet, etc). You have to call the microchip's company and have them update it. This may or may not cost you a few dollars. But really, what is the point in a microchip if it can't help your pet get back home. 3. If you move, remember to update the microchip as well. This was a reminder to us that we need to update Sadie and Dodgers information. It was just heartbreaking to us to not be able to find this dogs family. She appeared to be a loved pet and was just so sweet. No matter how much you love your animals you never know when something may happen. Take a moment today and make sure your pets information is updated so if they ever get lost they can be returned home quickly. Shane had a field trip to "The Farm" (aka: the pumpkin patch) with his preschool class today. It was a very cold morning, but NO rain which I was super thankful for. Bundled up Shane on some hay bales. Adalyn joined us on the field trip. She did very well hanging out in the backpack and watching the action. Riding on the bull swing. Playing in a HUGE container of corn. I had to get in with him, because he refused to go in alone. I thought it looked so fun I didn't want him to miss out on the experience. (NOTE: I was the ONLY parent in the corn pit!) On the way home he told me the corn was the best part. These are the kinds of friends Shane does best with...the animal kind. There is a picture just like this of me on my way to my preschool graduation...making friends with a random cat. Man, that kid is JUST like me. The good, the bad and the ugly. No wonder he pushes my buttons so well. He found his pumpkin. He said it looked just right for carving. And why not finish off a freezing morning at the pumpkin patch with a creamsicle?? I didn't hear any complaints from the kids, but the parents shook their heads a few times. 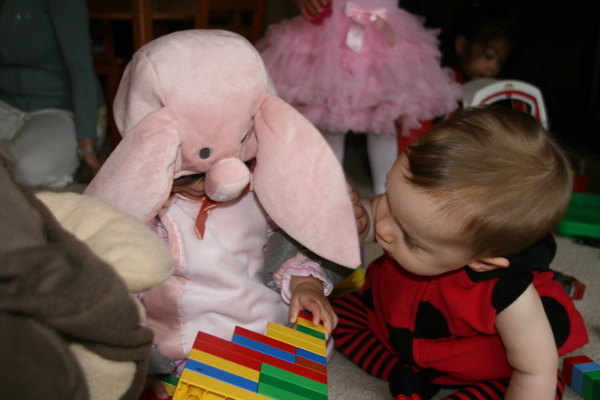 We hosted a Halloween Party at our house yesterday through my Moms Group. It was an intense and fun couple of hours with 10 Mommas here plus their kiddos all dressed in costumes. Everyone brought yummy snacks to eat and we made a scary ghost craft project. Shane spent the first hour in his room overwhelmed by all the peeps in his house. (NOTE: he was warned and was super excited until everyone arrived.) Adalyn napped during most of it, but while she was awake she sat and watched everyone. Arli was here and got right in the middle of the chaos and played, happy as can be. I made these super yummy No Bake Cookies. They were a big hit (if you like coconut). Adalyn the Fairy who really didn't like her tutu. What my living room looks like with 10 Moms and their kiddos. After everyone got settled in we moved into the kitchen and downstairs, helping slightly with the chaos. Arli making herself comfortable with another ladybug Mommy. Arli not concerned with the dinosaur stepping over her. 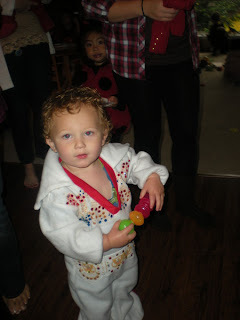 This little guy, Owen was dressed as Elvis. Shane asked me who Elvis was. Making me laugh even more. 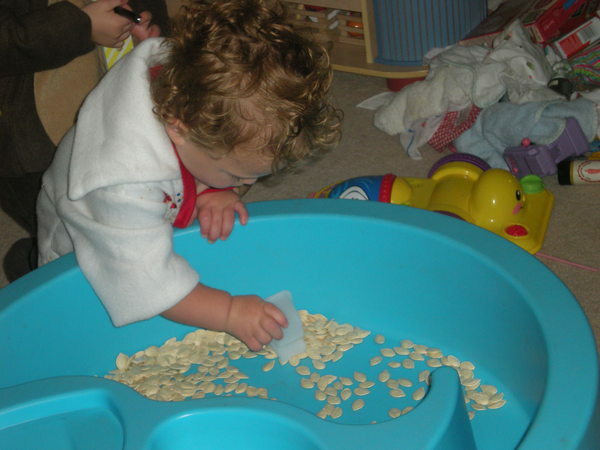 Pumpkin seeds make a great item for the water table turned sensory table. The ghost we made. He was easy, fun and cute. 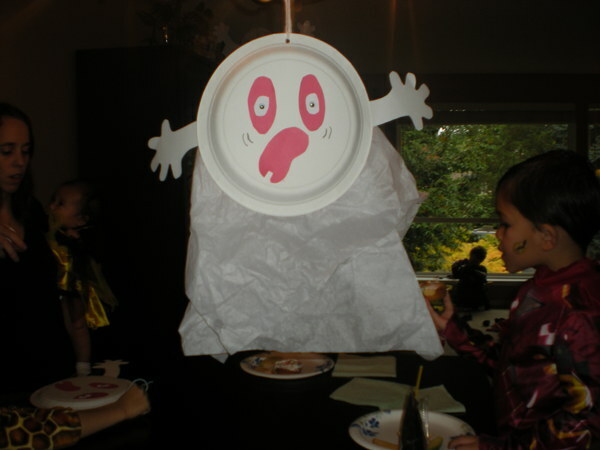 All you need is paper plate, paper for eyes, arms, etc and tissue paper. Mr. Shane the Turtle. He came out for the craft, but I couldn't move more then a step away from him. Just in case you are wondering....I was a cat. But by this point most of my whiskers had been rubbed off and I had to shed my cat tail because it kept getting caught or pulled on. 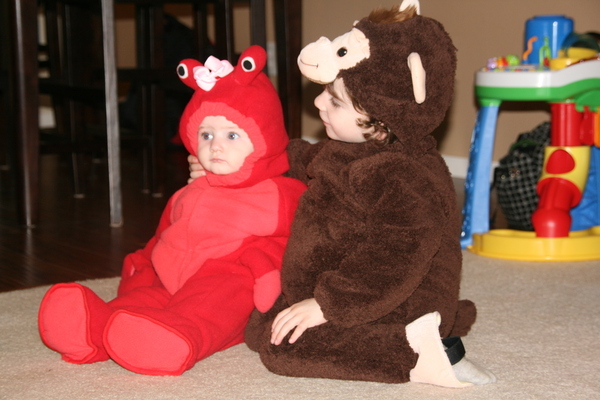 Lobster Elliot and Monkey Griffin...Sibling love. 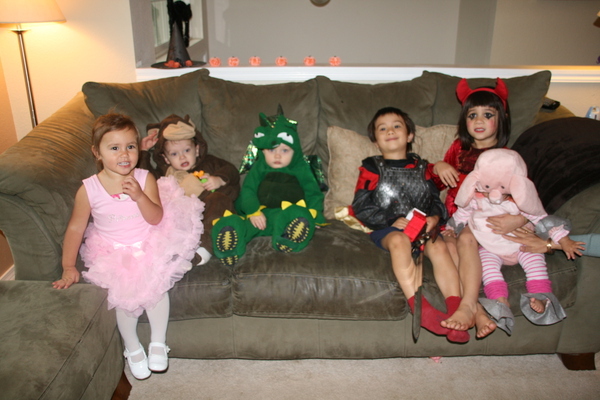 Some of the kids on the couch for a picture. This is my FAVORITE picture of the party. I like to call it Arli + Pig Friend Suri. I just love how Arli is peeking around Suri's ear to get a good look!?! Wishing Arli a big FIRST birthday today! Happy Birthday, Arli!! I'd say we have an official walker on our hands. I haven't seen her crawl in over 5 days now (could be longer, but that was when I noticed it and started paying attention). She is a persistent bugger. She still falls down, but gets right back up again. When she gets tired she falls a lot more and gets a little frustrated, but other then that she is walking and even at times is getting really fast, too. I've noticed during the day she literally does circles around the house. (practicing, maybe?) She grabs a toy and just keeps going around the kitchen, into the living room, through the dining room and back around again. Here she is on the move. This is 2.5 weeks after she took her first steps. A visit to the pumpkin patch is one of my favorite fall activities. We got lucky and were able to go on a beautiful sunny almost 70 degree afternoon. It was a perfect fall day. This poor little girl needs some shoes!! I had a bunch saved for her that I thought would fit when she started walking. Turns out they are all to small. And when I looked at the store I just couldn't believe that a size 4 was right, so I bought a size 3. Nope...to small. Yep....she needs a 4! Adalyn started pointing to things this last week. Then she say "ohhhhhh" while she is pointing. So fun and cute. She was telling Kenny about the birds in the sky. Big Brother very over the pictures and having to let his Sister sit with him. We got our biggest pumpkin ever this year. I can't wait to carve him this weekend. A couple of years ago I picked up an old window at a garage sale for $2. I just knew that it had potential. We then moved a couple times and have now settled into this house where I knew just where and what I wanted to do with it. Over the summer I sanded it and painted it white. Then it sat in the garage for a couple more months until we got the wire and hooks put into the back and Kenny hung it up on the wall for me. I do really love it, but it is not quite complete yet in my mind...it's missing something. I am not totally sure what it needs. I may have to spend some time on Pinterest and see what I can come up with. Maybe pictures or vinyl. I'd love to hear any ideas you have! I saw this blog post the other day and instantly knew I needed to implement this idea immediately! I've tried quiet time on and off with Shane, but it has always been a struggle or he just plan isn't quiet, so the idea of it kinda fell by the wayside. But for him and myself I think that quiet time is so important. He rests his body and I get a break from the million questions and "watch this" he says all day long. That was why I knew the quiet bins would help solve this problem. I made 7 bins, one for each day of the week. I averaged about 6+ activities in each bin. Right now I aim for 1 hour in his room for quiet time. He can play with his quiet bin, read books or rest on his bed. All other toys are off limits during quiet time. I also often give him his afternoon snack during this time as well. And at the end of quiet time he must clean up the bin. Below are the bins I made and what I have in each one. Note that we are super blessed to have a Grandma that just retired from being a 1st grade teacher. We were showered with all kinds of awesome things from Grandma Booth's classroom (Thanks, Jeni!!). Many of them ended up working perfect in the quiet time bin. Plus, I have lots of other things I can rotate into the bins in a month or so when he gets bored of the activities. I also pulled from his busy bag stash that I made a couple years ago. The only money I spent was to buy the bins. A $1.25 each for 5 of the bins and $4.99 each for 2 of the bins (I wanted a size that would hold a couple larger items like puzzles and geo boards). It took me about 1 hour to complete this project. And so far the last 4 days of quiet time has gone great!!! I have found it very interesting what he actually does with the stuff in the bin. It's not always what it was intended for, but he is a happy kid playing in there with his quiet time bins.Today he actually BEGGED for his quiet time bin! This bin has: lace up trucks, magnetic boy/clothes, alphabet busy bag, small car, geography flashcards, animal/word matching cards, and a cup/clothes pins. This bin has: animal flash cards, coloring book/markers, sorting busy bag, magnetic/magnetic balls and paper clips, shapes/color flash cards, puzzle and dominoes. This bin has: play money, National Geographic Little Kids magazines, his rock collection, laminated butterfly mazes/dry erase marker, magnetic alphabet set, puzzle and color/word recognition game. This bin has: dinosaur flash cards, coloring paper/crayons, puzzle, opposite match-up game, barrel of monkeys and a collection of stamps. This bin has: farm stickers/farm sheet, doodle book/fun color pin, bag of colored people/dinosaurs, pad of paper, matching game from a busy bag and puzzle. This bin has: geo board/rubber bands, sticker book/stickers, picture boards/shapes, buttons with a string and scoops. This bin has: tangrams, sorting busy bag, space flashcards, pad of paper/markers, full size puzzle, clock, car and number game. Here they are all labeled and stacked in his closet. Ah....looking at them just makes me happy. Little Adalyn is 11 months old today. Just one month short of a year! Likes -- Her Bunny...that should actually say Love. She Loves her Bunny. Doesn't Like -- Getting her face and hands wiped off after eating....that should say Hate, because she HATES that. Or her nose wiped...another HATE. Likes -- Her big Brother Shane. Where he goes, she wants to go. What he does, she wants to do. Doesn't Like -- Getting her diaper changed or putting on clothes. It's like wrestling with a stallion when you have to do either of these tasks. Likes -- Drinking water. She really likes to drink from her water cup at meal or snack times. Doesn't Like -- When someone goes downstairs with out her. She does not like that gate shut with her on the other side of it. That just means she is missing out on something! Likes -- Being in the backpack. As long as you keep moving she'll hang out in there all day long and watch all the stuff going on. Or if you hold her. She is just as happy being held and watching the action. Doesn't Like -- Baked goods...pancakes, muffins, bread, etc. She just isn't into those kinds of foods right now. They generally are gluten free, so maybe she is protesting because of that. Like -- Being outside. She loves going for walks or runs in the stroller or hanging out on the deck or swinging. "Frankenstein" -- That is what we call her now that she is walking...'cause she walks like Frankenstein. Last week was the first time I tried a new recipe and had to scrap the whole thing. It was oh so very, very sad! I spent all that time making dinner and then when I tried it....icky...it tasted so bad. For some reason the Italian Sausage I used just tasted gross and that taste was spread through the whole dish. It was even more sad because if it wasn't for that or if I had just used regular ground turkey, I think it would have been really good. 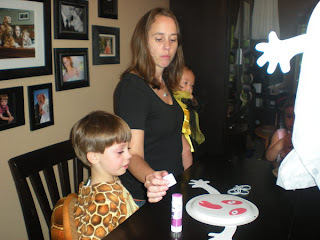 I had read about an idea for leaf painting on the Productive Parenting website. In the back of my mind I knew it would be a great activity for Shane. But I need to remember to gather leaves for this project. One day while we were on a walk I had him collect leaves for a surprise project when we got home. That kept him super happy and engaged on the walk. The original idea said just to use water. But I didn't think it was going to hold his interest long enough because there just wasn't enough change in the appearance of the leaves. So I got out his water color paints. He was so into it. I'd say he painted for at least 30 minutes. We did this a couple months ago before fall had arrived. Now there are even better leaves to collect and paint. We'll be doing this project again soon for sure. He wanted to save all of his completed leaves. This is what they look like a couple months later (on their way to the garbage can). Shane (soon to be 4.5 years old), does a lot of talking and asking questions about God. His preschool is connected to a Lutheran church and their curriculum includes simple lessons about God and the Bible. I wish I could say he goes to Sunday School. But unfortunately getting him to go any where with out Kenny and I has been such a struggle I gave up taking him about 2 years ago. I'd love to see him start going again. The thought is always in the back of my mind. Anyways...while we were eating lunch this is what Shane told me. Shane: God is bigger then a tree. God is bigger then our house. God is bigger then me. Me: Yep, God is the biggest thing in the whole world. Shane: But God is invisible. You can't see him. Me: (surprised, because we haven't talked about this before) Ya, you are right. God is invisible. Shane: But even if you were in your own heart, you still couldn't see God. Me: (even more surprised). Why yes, you are totally right. God does live in our hearts and even if we could see in our hearts, we still wouldn't be able to see God. Shane: Beaming from ear to ear! Ah...now there are the "rewards" I've been waiting for. I got my paycheck today in the form of a proud little boy and his brilliant mind. I am in LOVE with my new Halloween decoration I created last night. I got my inspiration from a fellow Close To My Heart Consultant and friend Michele over at Evergreen Memories. She picked up these "blank" witch hats at Michaels for just $2.99. I added paper from CTMH's Mischief paper packet to the hat/brim portion and along with some sweet 3-D paper roses from the new CTMH Art Philosophy Cricut cartridge, you've got yourself a quick, inexpensive and cute new Halloween decoration. I just love decorating for fall and Halloween.